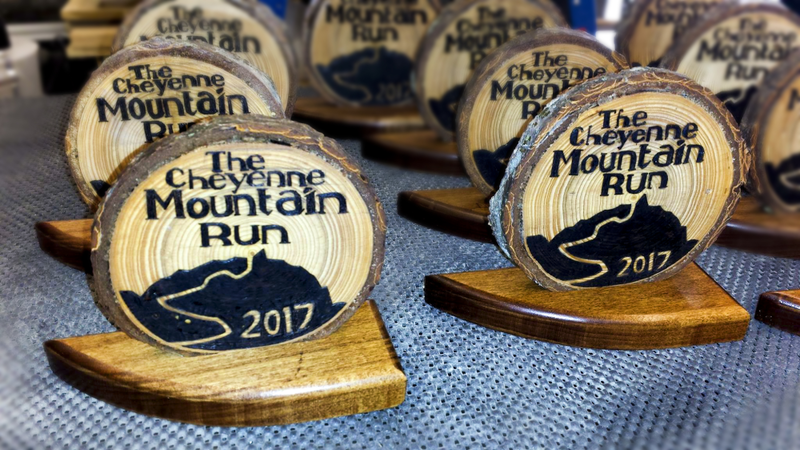 Register for The Cheyenne Mountain Run today! In the Fall of 2018, the Dixon Trail was opened at Cheyenne Mountain State Park in Colorado Springs, CO. This trail race will provide runners with a challenging heavy half-marathon race that will be about 14 miles in length. Starting elevation at Limekiln parking lot is 6,060’ and the turn around elevation is approximately 9,050’. Therefore approximately 3,000 gain and loss. The turnaround at the top of Cheyenne Mountain is remote and access is limited by a very rough 4-wheel drive road that is not open to the public. The exact turn around point will be posted as soon as we can access the top of the mountain and test equipment. 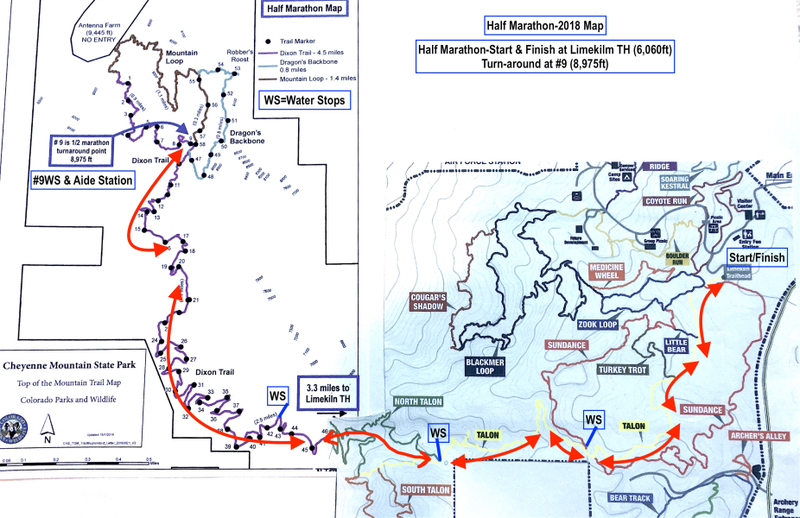 The heavy half-marathon will start at the Limekiln parking lot, west of the entrance to the state park and entrance fee gate. The race course heads west on Talon Trail, turns onto North Talon, at about 3.3 miles turns onto the Dixon Trail and finally .3 mile on the Mountain Loop. The Dixon Trail and Mountain Loop are on a single track that gains about 2,100 feet of elevation on the way to the turnaround. Portions of the Dixon Trail are in the process of continued construction this summer of and you will see notable changes since 2018. 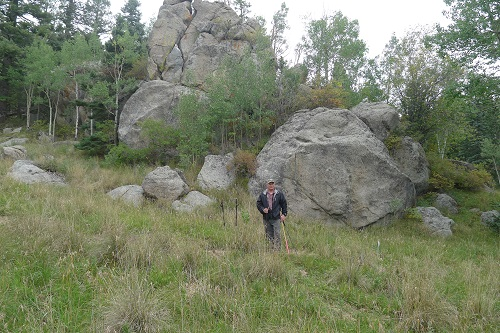 The upper portions of the Dixon Trail are the most difficult and the trail has steep and rocky sections. The total uphill distance is approximately 7 miles. The downhill portion of the race returns on the same course to the Limekiln Trailhead start and finish line. Due to the safety of both runners and volunteers, a CUT-OFF TIME of 12 noon to reach the turnaround around will be instituted. The timing station will be closed at 12 noon. Participants who have not reached the station by this time will be directed by course marshals to turnaround and head back down the trail. 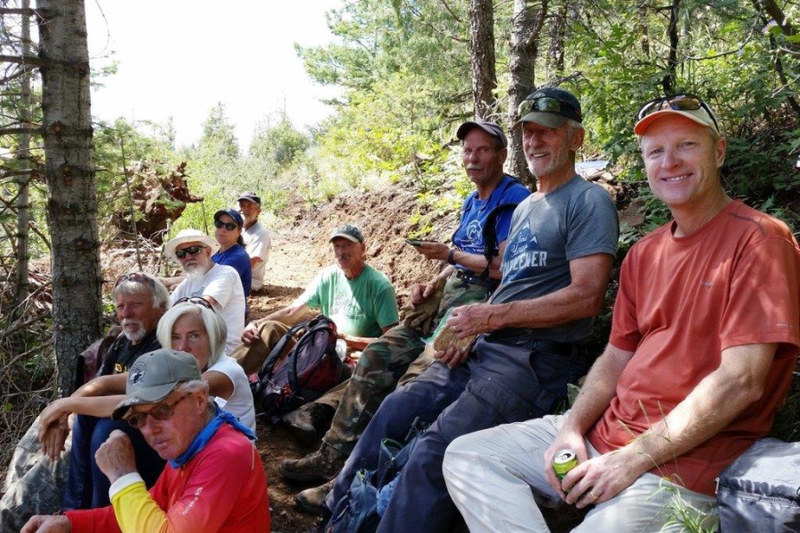 There will be water stops at the Talon/Sundance and Talon/North Talon Trail junctures, one just up the lower section of the Dixon Trail, and one at the top turnaround. Since this is an out and back course participants will have the same water stops going up and coming down. For about 3 miles of the Dixon Trail from the lower Dixon water stop to the top of the mountain runners will need to carry their own hydration and be prepared for weather changes. We will have course marshals, timing equipment, and a great aid station at the turnaround but participants won’t have any way off the top of the mountain other than coming back down the race course to the Limekiln parking lot. Skip College Football, Make It A Summit Day! 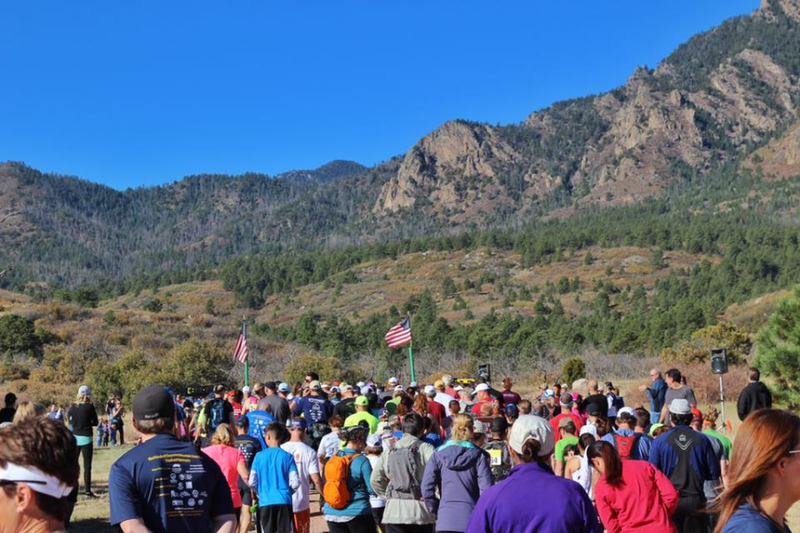 The Cheyenne Mountain Run on October 12 will go to the top of Cheyenne Mountain and back. 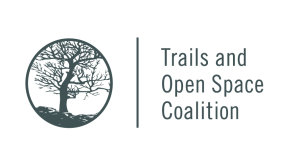 This is possible because of great trail work by several organizations and volunteers. This is where you'll turnaround once you get to the top of Cheyenne Mountain. This is the course map for the Half Marathon, which is actually 13.6 miles. Note that race day registration fees are more expensive than pre-registration fees, thus register early and save some bucks. The Half-Marathon course has a limit of 400 registrations. The limit is due to the two-way traffic on the narrow and steep sections of the Dixon trail. There is no limit on the 3 Mile course. 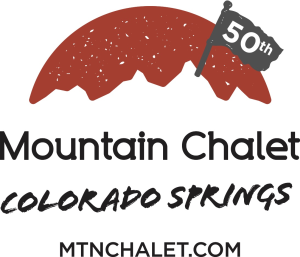 Early packet pickup is from 1 - 6:30 PM on Friday, Oct 11th, at the Visitor's Center in Cheyenne Mountain State Park. You can also pickup your packet on race morning starting at 7:30 AM. The awards breakout is as follows. For both distances, the Top 3 Overall winners are not eligible for age group awards. 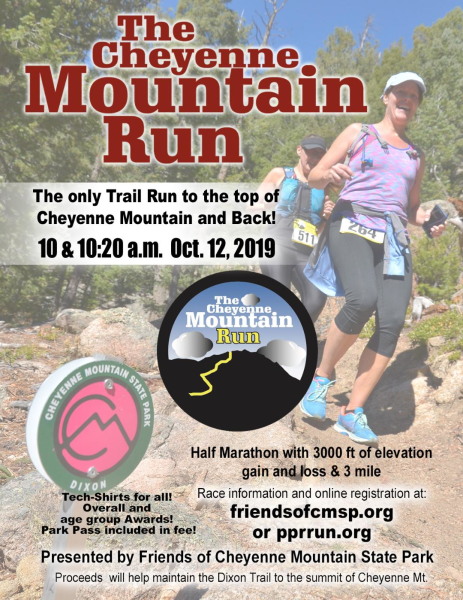 Additional race information can be found at http://friendsofcmsp.org/?page_id=957.